Written by Georg Holzmann on Jan. 19, 2017 in Development, News. Auphonic allows you to add external services to distribute processed and encoded result files to many hosting/storage providers or to your own servers. We released an interface to Amazon S3 four years ago, now we open our S3 interface also for other S3-compatible storage providers like Google Cloud Storage, DreamHost and many more. They provide affordable, reliable and high-performance podcast/media file hosting. All supported storage providers can be used for incoming and outgoing file transfers to/from Auphonic. In this blog post, we will first describe the setup of a Generic S3 Account, then the integration of Google Cloud Storage and finally present a list of other S3 Storage Providers. First, you have to setup your S3 Storage at the Auphonic external services page (click the button S3Storage). To do so, you will need to retrieve the Endpoint (Base URI of exported files and/or endpoint of the S3 service API), Access Key and Secret Key from your storage provider. S3 services use the concept of a bucket to store data, which can be located in one or multiple regions. Optionally, it's possible to choose from various access control (ACL) setttings, which determine who can and who cannot read from and write to your files. See the screenshot above for a quick overview of available settings. You can also specify an optional prefix that will be prepended to the name of every file in the given bucket. For example, with the settings from the screenshot above, a file my.mp3 will eventually end up at http://storage.googleapis.com/auphonic-bucket/my.mp3. The prefix can be used to simulate folders inside a bucket, for example, if you set the prefix to "my-folder/" and the filename is my.mp3, the final URL will be http://storage.googleapis.com/auphonic-bucket/my-folder/my.mp3. Google Cloud Storage is a reliable, high-performance cloud storage well suited for podasting and media file hosting: it's affordable and there are no limitations on storage size or bandwidth &dash; you just pay what you need. 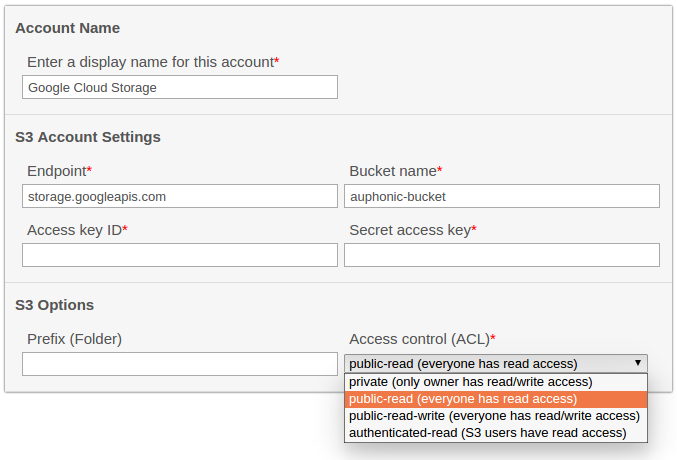 Buckets can be created in multiple regions for fast access, or for archiving (cheaper) - please see Storage Pricing. 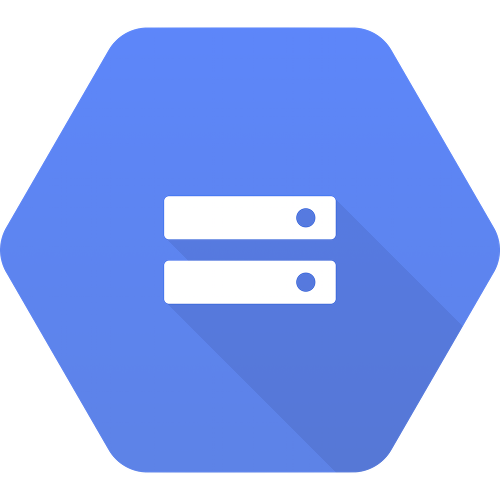 Google Cloud Storage provides an S3 compatible API which can be used in Auphonic. Create a new project or use an existing one in the Cloud Console. NOTE: Billing must be enabled for this project, please see Billing Settings. Go to tab "Interoperability" in your Cloud Storage Project Settings. Make this project the default project and create your Storage Access Keys. You have to create a bucket before you can use it in Auphonic. Do that in the Google Cloud Storage Browser. Add the bucket name in the Auphonic external service interface. Go to the Cloud Storage Settings Page. Get/Create your keys in tab "Interoperability" (NOT in tab "Project Access"). Google provides two different storage services: Google Cloud Storage and Google Drive. If you want to use Google Drive, please read this blog post! Amazon S3 is the online storage service offered by Amazon Web Services (AWS). Its interface (S3 REST API) is public and has become the de-facto standard for cloud storage and therefore many S3 compatible storage providers exist, even open source implementations of S3 compatible storage for your own servers. For even more, please see S3 storage providers. All these services should work with Auphonic (although we did not test all of them). Please let us know if you experience any issues or if you know additional services which should be added to the list!